He came to Limehouse on an Eastern wind, carrying tea and opium. The Basin swelled as cargo ships jostled for space – their curious treasures seized from far away colonies. He moored his vessel and heaved his crates onto dry land. Soon the barges would carry them up the Regent’s Canal, or along the Limehouse Cut, to all the corners of the country – where tradesmen would haggle over their contents – eventually to find their way into the drawing rooms of the aristocracy. High above the rest of London, St Anne’s church clock clanged. It did this four times each hour to guide the ships coming in from the sea. It was quarter past seven. The sun was in the west and daylight was sliding into dusk. A young woman stood on the bank of the canal beneath the Steven’s Railway Viaduct. She couldn’t help but watch him. Suspicion surfaced from the depths of her pupils. Even at this time the Basin was full of noise. The sail makers and barge builders had all packed up, but the transient community of seafarers still gathered at the water’s edge, getting their legs used to solid ground. Occasionally, the odd scuffle would break out – a fist might be clenched, a dagger drawn. But mostly they just hung around, acclimatising to their new surroundings, or getting ready to move on. Despite these distractions, her eyes were fixed on the peculiar man. Of course, she’d heard the gossip. Society whispered loudly about the foreigners squatting in the slums of Limehouse, gambling under shaded lamps. She’d heard all about the pub brawls and the lingering stench of unfamiliar food. She knew about the sordid transgressions. The dirt. The grit. The poverty. The stories of cockney waifs seduced by brutal drug barons. A prostitute with a wild tension in her jaw. She knew about the smoky alleys where heathens and murderers mingled. Violent. Tempting. Forbidden. The collapse of civilised society. And the dens where one could ‘buy oblivion’. The otherness of it lured her in. But she could feel her crinoline skirts weighing her down and her bodice forcing her frame upright. The church clock clanged again. Was there any truth in the rumours, she wondered? But then he was standing in front of her, holding out his palm. A tiny primrose resting in it. Somehow, two of the petals had got crushed and were starting to tear. He handed it to her and walked away. She stood there for a second. Motionless. Then, not worrying about whether anyone would catch a glimpse of her bare ankle, she gathered up her petticoats, turned towards the Commercial Road, and followed him into the Limehouse night. History rolled on and weaved through and built up and ran over and tunneled under and Victoria was succeeded by Edward and the steam train chugged along and oil lamps were lit and bombs were dropped and the fallen were commemorated and Chinatown faded and reemerged elsewhere while the poor in Limehouse sank deeper and deeper and a man saw this suffering and changed his mind and became prime minister and the NHS was born and then the Basin filled with luxury yachts but the canals kept flowing and the years dropped away and the seconds ticked by until time caught up to the Friday evening before the race. He came to Limehouse on the Docklands Light Railway, carrying his BlackBerry and a copy of the Metro. The train carriage swelled as commuters jostled for room – their personal space seized by the elbows of others. He got off at Westferry and walked along West India Dock Road in the direction of the police station. Sirens and black cabs whizzed back and forth, while the lights of Canary Wharf winked at him from the distance. On the opposite side of the road, a couple of smokers slouched against the wall outside the Westferry Arms. He checked his watch. It was quarter past seven. The sun was in the west and daylight was sliding into dusk. A middle-aged woman stood at the main desk inside the police station, watching the clock. It had been a long week and she just wanted to get home and prepare herself mentally for the marathon on Sunday. She finished her shift, put on her civilian clothes and got ready to leave. He reached the tin dragons opposite the station. The fire in their throats the last reminder of a Chinatown that had flickered with life long ago. Nerves jangled in the pit of his stomach. It was seven years since he’d last seen her. She didn’t know he was here, and he didn’t know how she was going to react. 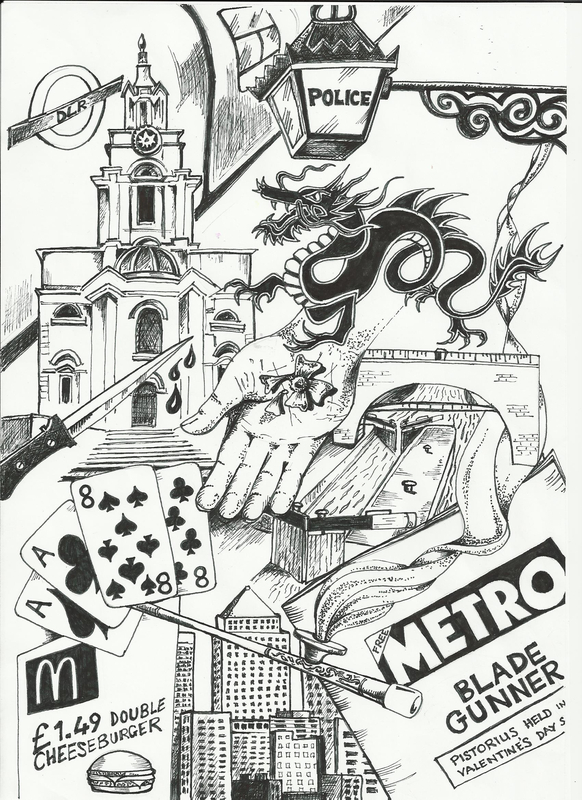 He glanced at the Metro to take his mind off it: hospital cuts, horse meat, an athlete on trial for murder. When she walked through the station doors, the Metro slipped from his hand and George Osborne was face down in a murky puddle. He knew he had to talk to her. You don’t just destroy something that’s taken years to build up. Then she spotted him. And the memories flooded back and washed over her. By now she was at the bus stop. He crossed the road and walked towards her. He wanted to kiss her right there in front of the McDonald’s ad. But these things take time. Instead they talked about the race, and he asked her to meet him for a coffee next weekend in Primrose Hill. They said goodnight and she turned to leave. ‘Good luck,’ he called after her. Brilliant in so many ways. Wow! Such tension and pacing and echoes of the past and present. Superb. Given me goosebumps. You are a storyteller supremo. So subtle. A pleasure to read. I was taken aback by the paragraph that chases through time – ‘History rolled on and weaved through and built up…’. Really exhilarating. Thanks Steph.